Leaving Ayers Rock was bad enough, but then within a couple of hours also having to leave the Northern Territory, well that was too much. As I said earlier we really enjoyed our 2 months in the NT and will absolutely be returning. We of course stopped at the border and took the required 'Border' photos. This is the the 5th border we have crossed so far this trip with another 3 to go. On our way to Coober Pedy we had an overnighter at Marla Roadhouse. Yet another example of a great roadhouse with excellent facilities at a very reasonable price. 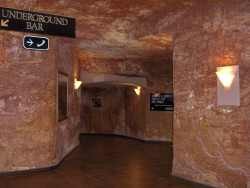 Next stop Coober Pedy. Now without a doubt this rates as the most unusual place we have visited yet. In fact it wins hands down. The intrigue starts about 20 kms out of town. All of a sudden out of the otherwise flat and incredibly boring countryside appears on the horizon a landscape that appears very moon like. Mounds, thousands of mounds of dirt as far as the eye can see. 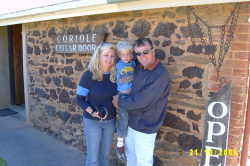 Welcome to Coober Pedy. You then enter the town. It is larger than we expected and on first glimpse looks just like any other small country town. Nice main street, tonnes of pubs, supermarkets and touristy shops. Its not until you either drive around or take a closer look that you start to see the main difference between here and elsewhere. As most of you will be aware a lot of this town is underground. Around 70% of people here live in dugouts. There are basically two different types of dugouts. The first and most common is built into the side of a hill, complete with front door. The second type of dugout is one that is dug straight down into the ground. You dig this type if you don't have a hill to build into. When you buy a block of land you own down deep enough to dig a three storey house. The rock structure here is so stable that it is possible to dig without any support structures. The whole thing is self supporting and some of the rooms are very large. The beauty of this is that the temperature is a constant 25 C all year round and no windows to clean. The other advantage is if you buy a new fridge and it doesn't fit in the hole, you just dig the hole bigger. And of course if you need more room, simply start digging. We heard a number of stories of people finding very valuable opals when building or extending houses.One guy found well over 3/4 million dollars worth. Now that really is a house that pays for it's self. We also heard stories of extensions gone wrong. Imagine digging away and finding yourself digging into your neighbours lounge. Apparently it happens! The other interesting thing that the more wealthy do is buy a number of adjoining properties and join them all together. One guy who did this has a house comprising of 40 rooms. Digging is also very cheap. Using a pick and shovel is free or getting a mechanical digger in will cost only about $4,000 for an average sized home. Can't complain about that for value. One home even has an underground pool. Now that is extravagant. 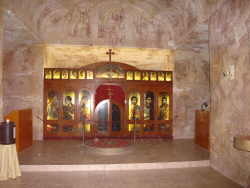 We visited underground churches, houses, motels and shops. I think it would be a fantastic way to live out here when summer temps regularly reach 45-50 C and winter temps around freezing. You wouldn't want to be claustrophobic though. Of course you don't come all the way out here without doing a bit of noodling. No, not kanoodling, noodling. This is a marvelous pastime that Chris and the boys almost became obsessed with. It entails going to a public noodling area, which are just huge mounds of dirt in the blazing heat and searching for opals using nothing but your bare hands and a bucket of water. 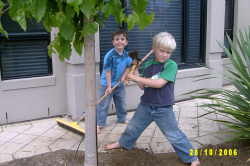 While it appears others do very well from this pastime all we managed to do was get very, very dirty. As for the opals, well not this time. It was lots of fun and you can almost see how people get 'Opal Fever'. If you found one it would be very difficult to stop. The other thing that really stood out about this place was how friendly the people were. They would talk all day and didn't seem concerned at all whether you bought anything or not. Maybe they are already stinking rich!!!! If you can, you should make an effort to see this place before it changes too much. Some real characters live here, and boy would there be some stories to be told. It was another trip highlight. We had an overnighter in a free camp on the way and arrived in Woomera well before lunch. We thought we might stay in Woomera the night but as it turned out we had time after our sightseeing to move the 70 kms down the road to Roxby Downs. Now Woomera is an interesting place. It is obviously well known for its participation in the 'Space race' and still today the rocket base is alive and well, be it not very busy and also for having the (now closed) detention centre for refugees. This whole town is owned by the military and you cannot purchase real estate or simply decide to live here. Because there are so many military homes and not much happening in the rocket department, BHP Billiton who have a large mine at Roxby Downs lease some homes for the miners. BHP runs free shuttle buses back and forth to Roxby for the workers. This little town with a current population of just over 300 people has a school, a cinema and 2x 50 metre pools. What they don't have is any shops. Other than the information centre that has a cafe and 10 pin bowling alley there is one small corner store. On shopping day it would be off to Roxby or starve. The information centre also houses the rocket and science museum. This is extremely good, really well presented and large enough for you to spend an hour or two. When you have finished inside its across the road to the local park that has 15-20 real rockets on display. This display is also excellent and it was good to actually see what you had just been reading about in the museum. This is undoubtably Australia's best public display of rockets. Next stop - Roxby Downs. At one stage it looked like we were going to have nowhere to sleep as the BHP mine, Olympic Dam was in the middle of a maintenance shutdown and hundreds and hundreds of 'fly in, fly out' contractors had to be housed. Luckily there were a few powered sites left for tourists and we got one. I don't know if we should have felt safe or nervous but because BHP has so many staff and contractors staying and living here they employ 24 hour 7 day a week security guards to patrol this privately owned caravan park. Work was still going on at Olympic Dam, so we joined a tour to gain an insight into the operations of the mine, which was very informative. At this stage it is a huge underground mine (856 metres down, with 250km of roads) producing copper, uranium and gold and silver as by-products. They have expansion plans for the future, which includes an open cut mine, larger than Kalgoorlie. 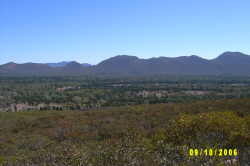 The town itself was purpose built when mining operations began in 1985, with all the mod cons. We also ventured to Andamooka from here - another classic opal mining town in the middle of a surreal landscape, for you guessed it, another go at noodling! I wouldn't mind if they actually found something.....!! On the wall in the caravan we have a large map of Australia that we mark with a nikko pen our travels. We have now completed a large loop. For those who have been reading this log since the beginning may remember that Port Augusta (back in January) was pretty much the beginning of our 'Touring'. Well we are now back where we started. 10 months, 30,000kms and memories to last a lifetime, the circuit is complete. Port Augusta is home to the 'Pichi Richi' railway which is owned and voluntarily run by the local historical society. The trains run on the original 'Ghan' rail line to Quorn, about 40kms away. They have both steam and diesel engines that do the trip. When we came through in January we wanted to do the steam trip but due to 'fire bans' during the summer months only the diesel engines run. We planned then to come back on our way through and do the steam trip which we did. The boys love trains and we did the 6 hour trip which was excellent. The weather was lovely and although the countryside was very dry it was still a pretty trip through the Pichi Richi pass. A couple of nights in the big Port Augusta, and finally a decent shopping centre to restock and we were out of here and off to the Flinders Ranges. The Flinders are huge and would take a significant amount of time to really see it all and do it justice. We stayed at Wilpena Pound Resort which is at the southern end of the 'pound' for 4 nights and in that time did a couple of 7 km walks and a few car trips to nearby sights. What really stands out the most in South Australia is how incredibly dry it is. I am talking dust bowl dry, so unfortunately we did not see this area at its best. The day time temperatures were lovely and the nights cool. Perfect camping weather. As we head further south the dropping temperatures have been noticed. From here we will be heading straight to Adelaide where we plan to spend at least 2 weeks. Most of that time will be spent catching up with friends and family. My brother and his kids live there and the boys are really excited about seeing their cousins again. It will be good to see Wayne, Tracey and little Bailey again and also hope to see Derryn and Carla if they get down here from Darwin in time. I spent 12 years living and going to school in Adelaide so it will be good to see it again after so long. The trip to Adelaide through the Clare Valley was beautiful and for the first time in nearly a year the countryside was green. In fact considering how little rain even this area has had this year, it was very green indeed. We arrived in Adelaide mid-afternoon and went straight to Wayne and Tracey's. 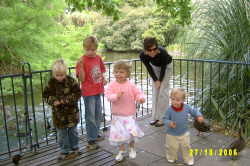 We had planned to stay with them at least for part of our time here but ended up staying with them for nearly 3 weeks. The van fitted nicely in the driveway, while we stayed in the house. My god, caravan withdrawals! They have a beautiful home with an upstairs self contained two bedroom/bathroom/living area so that became our little home away from home. Because we were out nearly every day and many nights it worked out really well and don't think we annoyed them too much. So from day 1 we were into it. Our first port of call was to go down and see the house I grew up in. It looks very much the same and I was relieved to see that it hadn't been knocked down to make way for units, like so many others. I knocked on the door and introduced myself and asked if I could take some photos of the outside. To my surprise they invited me in so I had a good look around and reminisced. It was funny to see my old bedroom again after so many years. Although the house has had a couple of extensions since we left, it still looked very much the same. What a great opportunity and what lovely people to let a complete stranger into their home. We then went to my old high school and had a walk around it. Boy has Brighton High changed over the last 30 years. So with memory lane out of the way it was time to show the family a little more of this beautiful city. For some odd reason almost everyone we have met over the past 20 years seem to all live here, as well as my brother Grant and our nieces, Tayla and Kira, so it was a very busy time catching up with them all. Firstly we saw Greg, Brit and the kids. We met Greg and Brit in Bali about 12 years ago and have kept in touch ever since. It is funny with some people, that although you haven't seen them for years, you just slip back in like you see them everyday. We saw them quite a few times during our stay which included a few sightseeing outings and a lovely dinner at their magnificent inner city home. They are currently in the process of selling their business and then plan to buy a van and travel around Oz for a year. I told them to go for at least two. I must say we are very jealous. They are right at the beginning of their adventure and ours is rapidly coming to an end. Oh well, who knows what will lay ahead for us in the future?? Then it was off to see Andrew and Lorraine (and Emily of course) Gladman who we first met in Cairns about 5 years ago. We have seen them a number of times since then and have had other trips away with them. They came on the 'Parfitt Tag Along' to Airlie Beach and Hook Island a few years back. We had a great night at their place and finally got to meet their other daughter, Melissa after all these years. It was great to catch up with Andrew Mollison and his lovely long suffering wife Louise. I have known Andrew since I was a kid. Andrew was my St John Ambulance Leader when I was a cadet and we have kept in touch for all those years. They took us out for dinner one night and then we went for a drive up to their shack at Bow Hill, which is on the Murray River not far from Murray Bridge. What a sensational spot. A great shack, well actually a house with green grass right to the waters edge and ski boat in the shed ready for action. This really is a magic part of this country. We had a great day with them all and were lucky enough to meet all but one of their children. We saw Grant (my brother) and the girls every few days which was great and managed to get to Adelaide just in time for Kira's 10th birthday. Alex had a weekend sleep over and had an absolute ball while I suffered separation anxiety all weekend. Boy, what am I going to be like when they finally leave home?? 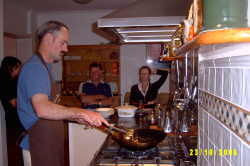 We had a lovely dinner that Rae (Grant and the girls house mate) cooked up for us. It was also great to catch up with a long time family friend Rod. He seems to work far too much so we were only able to track him down long enough for a cuppa in a coffee shop. It's really annoying when people you haven't seen in over 15 years look exactly the same. Bastards!! So what sightseeing did we do. Wayne and Tracey took us up to McLaren Vale and we visited a few wineries, we went to Port Adelaide and did a boat cruise up the river and visited the famous 'Port Markets'. 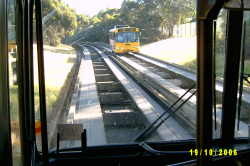 We visited Glenelg and went on the tram into the city and back. The trams are now very modern and have absolutely no appeal, unlike the old rattly ones that ran for so many years. We spent a day in the city, visited the Museum and walked along the Torrens River and caught an amazing bus. This bus is called the 'O-Bahn" and drives on the road like any other bus but then drives onto specially designed tracks. It travels at 100 km/hour and the driver doesn't need to steer it. It was a strange feeling to watch this bus drive itself. There is only one other working arrangement like this in the world and it has been very successful. If necessary it can transport thousands of people an hour using the large fleet of modified buses. We spent the day at Victor Harbor and caught up with Karen who we met on our trip somewhere in WA. Unfortunately her husband Quentin was away working so we didn't get to see him, and the kids were at school. These guys have just finished 12 months on the road and are attempting to settle down. Good luck. Victor Harbor is a great spot and a very popular holiday destination for South Australians. 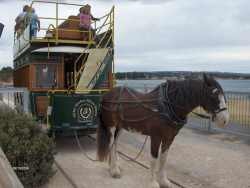 There is a long jetty out to Granite Island with a horse drawn tram that takes you out to the island and back. Granite Island is also home to a thousand or so penguins. Unfortunately you only get to see them at sunset when they come home from a day's fishing so we will have to see them next trip when we actually camp out at Victor Harbor. The tram trip and walk around the island were excellent and well worth doing. We then spent the day up in the hills exploring places like Hahndorf and Mount Lofty. You simply cannot do this area justice in a day, probably not even in a week so we will be back. Hahndorf as you may have guessed has a 'German Heritage' and the small local bakeries make without a doubt the best 'Beesting' cake around. One of my childhood memories is stopping here and mum and dad buying a slab of beesting that we all devoured. Of course we did the same, and it is just as good as it used to be. Only a few days before we left Derryn, Carla and the kids made their grand entrance into Adelaide, with Austin Powers in tow. 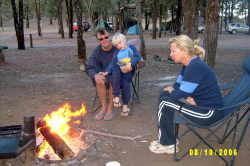 We all met at the same caravan park in Perth many months ago (Wayne and Tracey, them and us). It was really good to see them again and we had many late nights together discussing the trip and laughing over numerous bottles of good SA wine. Derryn introduced the kids to the concept of gambling while the men babysat the kids and the girls went out for dinner. What a funny funny night we had. The look on Harry's face as he lost all his lollies in a hand of 'Blackjack' was priceless. With a bit of luck it will put him off gambling for life. Hopefully we will see them again as we all make our way slowly over to the East Coast. So that was pretty much it for Adelaide. This is without a doubt one of the nicest cities in Australia. It is trendy and modern but at the same time quaint and charming. The beaches are beautiful, with endless coffee shops, parks and bike tracks.The mountain range that surrounds the city adds immensely to its beauty. The Barossa Valley and Murray River at your doorstep just adds even more to its appeal. Adelaide is a very special place and yet another to add to your must see list. If it was not for the weather I could no doubt live here again. It's just a little on the cold side for us I think. Finally we packed up, hooked the van on and moved out of Wayne and Tracey's driveway. Harry sure will miss Bailey, as we will Wayne and Tracey. Our time together on the road has forged what we are sure will be a life long friendship. Our next stop will be Tailem Bend to stay with another family we have met 'On the Road'. It's these friendships that make this life on the road so very, very special. These months are flying by faster than that FA18 that we saw in Katherine. We are now certainly out of the remote bush of Australia and very much back into civilisation. While that is in one respect comforting, it is in another sad, as we leave the rugged and isolated, and head into the crowded, fast moving and stressful Eastern States. We will all seriously miss the north and all that it has to offer. For some funny reason it felt like the trip was over as soon as we reached civilisation again. Car and van still going great. A few minor repairs to the van were needed in Adelaide and we also scored a full length ARB roof rack for the car off Wayne, which took a little while to fit and to repack all the gear on. He no longer had a need for it so sold it to us cheap, as long as we promised to finally get the van out of his driveway! Our plan now is to make our way across to Eden in the very south of NSW over the next 2 weeks to stay with another family we also firstly met in Perth. Bryan has kindly offered to help me build and install a new chassis and A-Frame for the van complete with new Roller Rocker suspension. The old girl (the van, not the other one) won't know herself and will ride just like a new one. I am very much looking forward to getting that job completed. It will be great to see Bryan, Jayne and the boys again, I'm sure it will be a hoot. That leaves us now with only 6 weeks until we are back at 'Cotton Tree' on the Sunshine Coast for Christmas and then back to ______ (Sorry, I can't bring myself to say the word). On one hand the thought of heading home is a little depressing, but on the other hand exciting, as we plan the next stage of our lives. Stay tuned for the next nail biting chapter in the lives of "The Grand Touring Trailer Trash Parfitt's"